Open letter from Bill Lee. Above picture is of Bill Lee. An S.S. America "Open Letter" by Bill Lee. An open letter to all fellow admirers of the SS AMERICA…everywhere! Please permit me to introduce myself. My name is Bill Lee. I was born in Newport News, VA within sight of AMERICA’s building ways. At the tender age of three, I attended her launching ceremonies. I really don’t remember that day, but it was the social event of 1939, so I’m told. And I have been following her adventures ever since. Sometime in my early childhood, I started collecting AMERICA memorabilia. Much of this initial part of my collection is in the form of glossy news and pr photos, provided by my father. For decades, he was managing editor of the local newspaper and had access to what are now rare and treasured items. Many of these pictures were published in the Newport News Daily Press, and several have notations on the back in my deceased father’s handwriting that materially adds to their value for me. Those same neighbors/shipbuilders, knowing of my interest in AMERICA, often brought me small items (such as now-rare WEST POINT era booklets that were just tossed in the trash during the re-conversion). The United States Lines also produced many pr photos of her renewed public spaces (as well as some comparison views taken during her war years). Of course, my father dutifully brought them home to me to add to my collection. When AMERICA left to resume her civilian career, hundreds of people watched from the elevated advantage point of a bluff just east of the shipyard property as she was backed away from her pier and turned downstream in the James River. As she passed us, decorated from stem to stern with colorful signal flags, her great twin steam whistles blasted again and again, answered by the toots of attendant tugs and the higher pitched voices of numerous vessels anchored in the harbor and berthed at commercial cargo piers. In subsequent years, watching her leave following annual voyage repair visits to Newport News Shipbuilding (usually in November) became a pilgrimage of sorts for those of us who followed her career. Her departures were always well publicized locally, thanks, naturally, to my father! During the fifties, especially, I was amongst those on the bluff almost every time she departed. One of my favorite pictures of her was taken on one of occasions. Entitled "The Queen Salutes", this award-winning photo shows her underway with steam billowing from both whistles. She never looked (or sounded) better to me! In 1951, when the SS UNITED STATES when nearing completion, my father arranged a visit for me with Commodore Harry Manning at a local hotel. He had been advised of my interest in AMERICA, so I carried along my growing collection, which he patiently (I suppose) reviewed and then complimented as he ended our brief meeting by presenting me with an autographed photograph of himself on the port bridge wing of AMERICA. Also in 1951, I wrote to US Lines, advising them of my interest and boldly solicited anything ‘americana’ "they could spare". Imagine my surprise when I received a bundle of deck plans, New Yorker ad proofs, and additional pr material. But the biggest surprise was the arrival a few days later of a large, framed reproduction of W.J. Aylward’s famous painting of AMERICA outbound from New York harbor. This is a commercially mass-produced piece; probably widely used in US Lines’ agent offices in those days. It measures some 32 inches by 24 inches, and to this day retains its colorful appearance. And it’s still quite a treasure which I happily display in a place of honor in my retirement home in North Carolina. 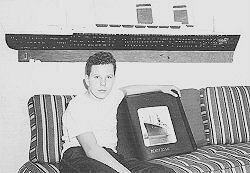 By the mid-sixties, I had finished the Apprentice School and college, and was hard at work in the shipyard’s nuclear power design department. When AMERICA arrived in 1964 for her traditional voyage repair visit, I walked down to the waterfront one lunchtime to look her over up close. Since I really had no business onboard, I didn’t try to find some innovative way to gain access. My mistake. In the long years since, I have continued to accumulate AMERICA memorabilia, and have included items representative of her several later lives. While several well-meaning friends have sent me information and pictures in recent years of her current sad state, I must profess no real interest in perpetuating such memories; nor of visiting what remains. Rather, I prefer to remember her when… I look forward to the day when the sea finally claims the last of her, and we all can replace those stark, sad images from the Canary Islands in our minds’ eye with happier visions of AMERICA in her prime. Nevertheless, I have thoroughly enjoyed finding numerous indications on the Internet that this once-wonderful ship has left a lasting impression on many others whose paths once crossed hers. And I applaud those who continue to add to this electronic memory base. I am pleased to make myself (and my life-long hobby) known to you at this time. Perhaps I may join you in the continued exchange of memories, and contribute from time to time to your trips down AMERICA’s memory sealane from a different perspective. There is something about a ship that makes it the most loved of man’s inanimate creations. To share in the formation of a seagoing vessel brings to the shipbuilder That Certain Feeling and he belongs to her episodes thereafter. He follows her trials at sea, he rejoices in her good fortune and fame, he sets her apart from all others as his very own, and he mourns her eventual demise. A crewmember may feel as if he is part of a ship, but the shipbuilder knows he is. He knew her before she was fully conceived in the drawing rooms, he saw her lying helpless in her shipway cradle, he was present at her christening, and he witnessed her graceful slide into her natural element. He remembers her first unassisted step as she backed into the channel, turned her bow seaward and rounded that last bend - going out of sight - perhaps forever. To others who may line the riverbank, it is a grand and joyous occasion. She gathers speed, her freshly painted topsides sparkle, she passes other vessels at anchor in the harbor, she proudly returns their welcoming salutes with virtually continuous blasts of her own steam whistles. But to the shipbuilder, it is as if he has given up a daughter in marriage to King Neptune. As she passes from view, and even as he turns to his next creation, the shipbuilder hesitates, he strains to hear her last faint goodbye. And then he has That Certain Feeling forevermore. In the summer of 1989, when she lay neglected in the backwaters of Greece, and in real danger of being scrapped, Newport News shipbuilders remembered AMERICA one last time. In a wake of premonition, her eventual demise was marked beforehand by the offering of memories to the yard’s in-house publication by many of the employees and retirees who had designed, built, converted, re-built and maintained her from 1938 until 1964. Entitled "Farewell America", it took most of two issues of this publication to contain the many fond memories her creators wished to offer in final tribute…and to inspire future generations of shipbuilders. Recently, I visited the Mariners Museum in Virginia and the Maritime Museum in New York. The Mariners Museum contains many contributions of AMERICA artifacts from NNS, including original oil paintings by Skinner, her last set of nameboards and a highly detailed model, over twenty feet long. The Maritime Museum is the main repository of items recovered from the once-proud US Lines. On display there are her builder’s plate, ship’s bell, additional original paintings and other memorabilia. Only at these two locations can one now see and touch these few remaining AMERICA treasures. Feel free to share this message with anyone…everyone you know who may have similar fond feelings for AMERICA. I wish for you fair winds and a following sea in any and all future efforts you might undertake to help perpetuate the memory of your ship, their ship…and my ship. You can e-mail Bill Lee here. The above "open letter" is courtesy of Bill Lee, thanks for letting me share it with everyone.